“It’s kind of like an art gallery opening feeling,” Keino said. 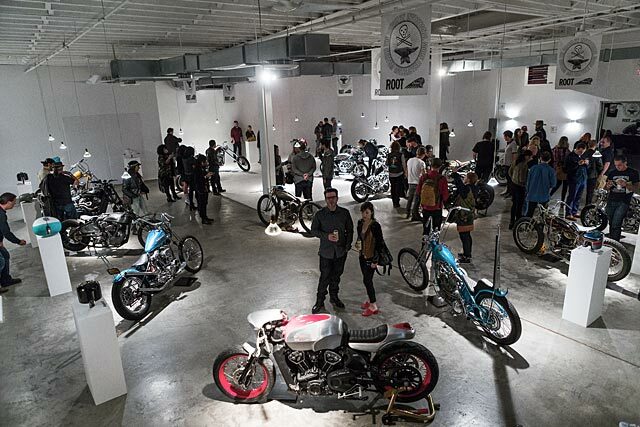 “Originally the idea was about this Northeast area.” Sasaki and his partners would invite nearby friends they knew with cool motorcycles to exhibit at the show. Fast-forward nine years later to 2017, and the curation grasps the entire planet. This year you could still find locals like inventor, designer, artist manager and film producer Stuart Parr showing off a picture-perfect MV Agusta, but then you had Sweden’s Nicke Svensson showing off his dystopian, alcohol-swilling, kickstart-activated, 12:1 compression Vardhalla OHVL Knucklehead. Walk into Root Studio, the art venue where the Brooklyn Invitational is held, and it feels like you’ve stumbled into a two-wheeled periodic table. Not one machine in the gallery is similar to another. An original pre-war “survivor” breathes the same air as something born only this year and built from scratch. Oozing its reluctance to lean, an eccentric chopper lurks behind its near-polar opposite: a vintage Harley Sportster race bike that will shear the denim off your kneecap if you stare at it too long. 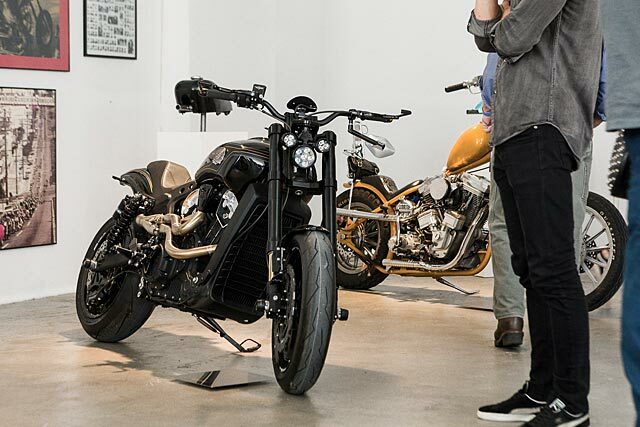 Every one of the motorbikes in the gallery is a work of art, but the diversity of the several dozen motorcycles in the collection is an art form in itself. 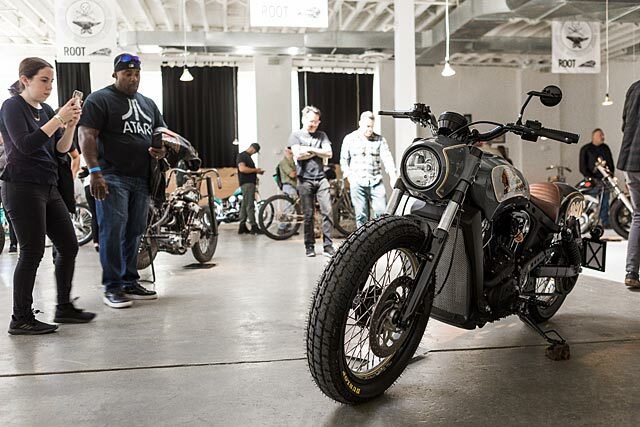 In keeping with that unified, yet diversified theme, Indian Motorcycle, the Brooklyn Invitational’s title sponsor, used the event to unveil three custom versions of the all-new Scout Bobber. 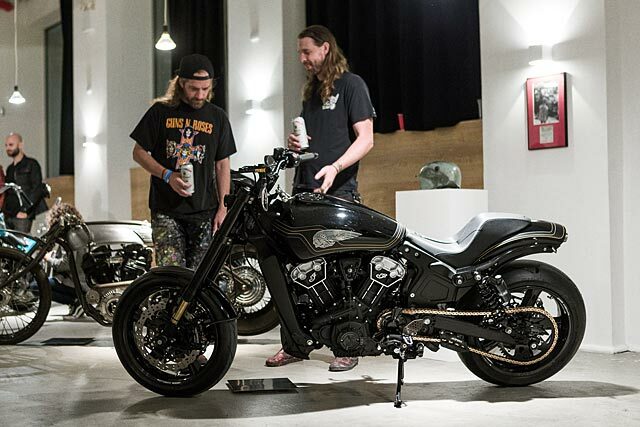 Indian commissioned Keino Sasaki as well as Satya Kraus and Steve Caballero working in conjunction with Roland Sands to craft their own, diversified interpretations of design and engineering from the same Scout Bobber canvas. In short, Sasaki’s version is the one at which we can’t stop staring, Kraus’ creation is the one we’re foaming at the mouth to ride, and Caballero’s and Sands’ motorcycle is the one on which we want to be seen (and heard). 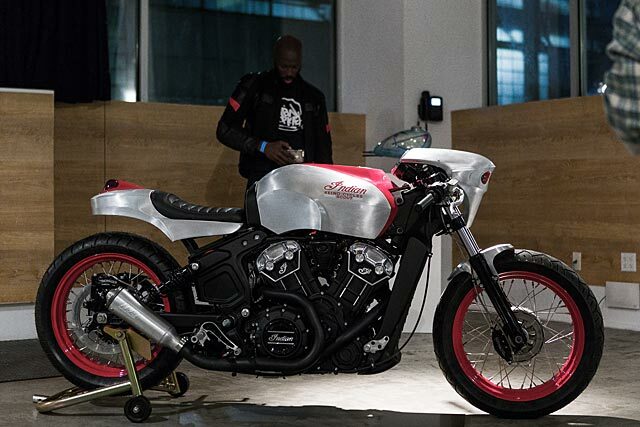 It took six weeks for Sasaki to complete the Keino Cycles Scout Bobber. Having never worked on a new Indian motorcycle before, Sasaki found a challenge lay ahead of him. Sasaki’s modification list is actually short in comparison to how extensively he’s changed the bike. He somehow figured out a way to simultaneously pull you both forward and backward in time with every glance at his creation. The Keino Cycles custom Indian Scout Bobber is inspired by streamliner trains, airplanes and automobiles of the ’50s, ’60s and ’70s, but by cherry-picking the best from that buffet, Sasaki has built a machine evocative of a Tron light cycle. Sasaki is a master of understatement. It’s apparent when looking at his bike that the “little bit of skill” and “just turning the motorcycle into something else” translates to “Ph.D.-level craftsmanship” and “massive transformation,” respectively. It’s easy to appreciate that massive transformation, too. All you have to do is let Sasaki’s build dance in your eyeballs, and you’ll begin to feel a catharsis. For Satya Kraus’ build, however, it might take a little more effort to get the emotions flowing. You may actually have to swing a leg over his bike and go for a ride. Kraus did a stellar job on the design, no doubt, but once you get a feel for the attention to detail he’s put into the chassis and suspension, you’ll be clamoring to ride it as much as girls clamored to ride John, Paul, George, and Ringo back in ’64. Where that attention to detail may be focused most is on the one element Kraus couldn’t stop talking about all weekend — the triple trees: at first assumption, a piddling piece of the overall motorbike, but as Kraus points out, a crucial component when it comes to his customization philosophy. “Ever since I was young, growing up on dirt bikes, growing up on performance bikes, I realized that the geometry makes a huge difference,” he said. “If you go out and ride flat track, there’s a specific geometry that you’re going to either develop, or build into, or modify the motorcycle to have to be able to perform the way that you need it to as a rider. What I’ve been able to do with triple trees, specifically, is be able to transform a motorcycle. I mean, really night-and-day rideability in a motorcycle, so by changing the offsets of the triple trees, by changing the structure of the triple trees, [tweaking] the design to carry more load in certain places, to create more connecting force with the forks, different fork stop positions so […] if you’re on a track and you need more movement in your front end, all those little details create a more rideable, more comfortable, safer and better-performing motorcycle. As much as Kraus talks about function, he’s not necessarily a function-over-form guy. 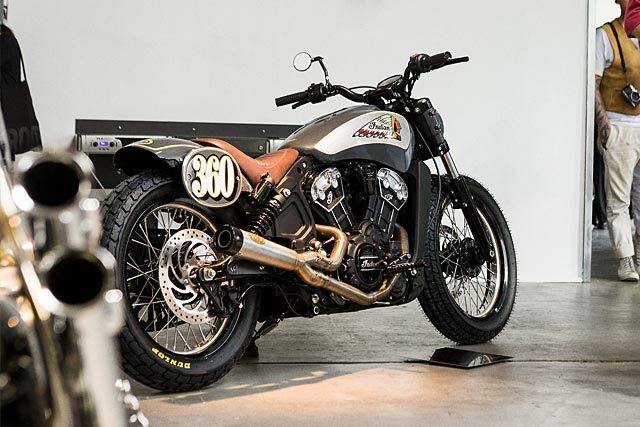 Though Kraus is function-focused, there’s certainly no shortage of design when it comes to this Kraus Motor Co. custom Indian Scout Bobber. The 2-into-1 exhaust recalls the Medusa-hair headers of the 1967 Ferrari 312 Formula One racecar, and when Kraus ignites the V-twin, the sound that emanates from their openings offers the fright of a snake bite. 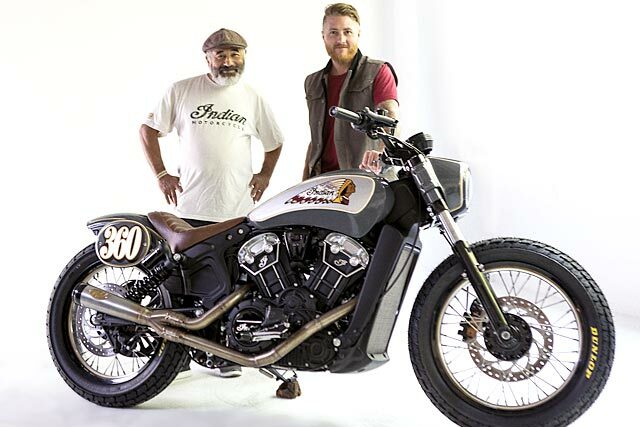 Yeah, we need to ride Kraus’ custom, but just because we have high hopes for its dynamics doesn’t detract from our high hopes for the Steve Caballero/Roland Sands Indian Scout Bobber. 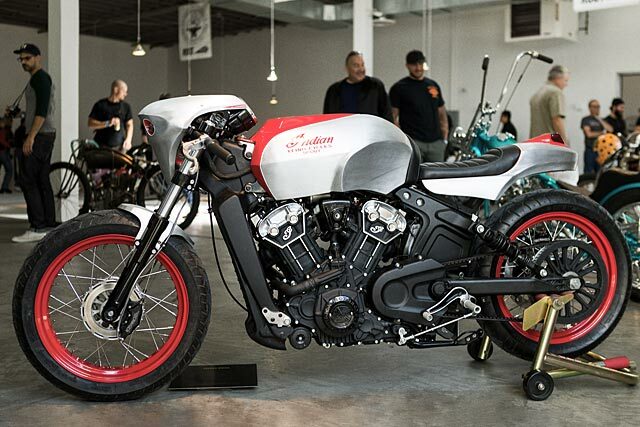 The design is not as distant of a departure from the standard Indian Scout Bobber as the other two designs, but as this build demonstrates, the new Scout Bobber is such a good blank canvas that if you choose to go lightly on the appearance mods, you’ll still have a great-looking bike. 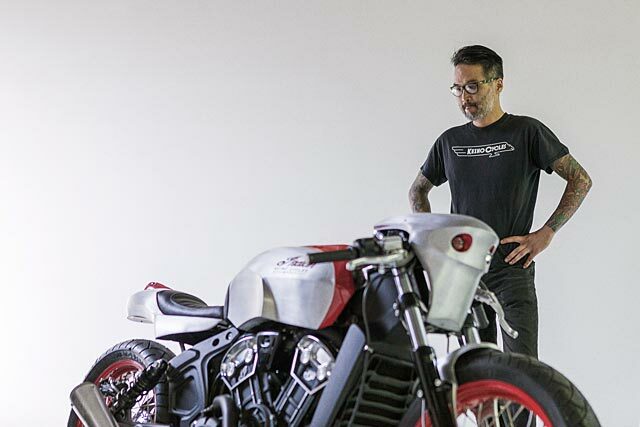 Also, there’s no need to be too different from the standard production motorcycle when you have two legends — Steve, a skateboarding hero, and Roland, a motorcycle racing and design hero — at the helm to add a palpable legacy to this custom. This build took three weeks complete. That’s a week shorter than the Kraus bike, and three weeks shorter than the Sasaki custom Scout. Interestingly, this build has the longest modification list of the three Brooklyn Invitational customs. 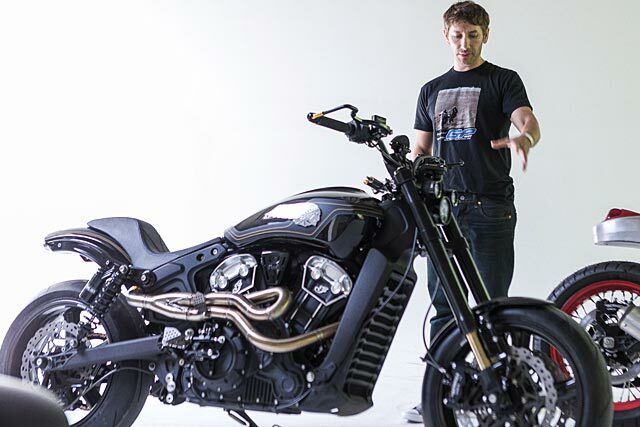 The RSD track stainless-steel, 2-into-1 prototype exhaust is our favorite mod on that list, a.) because it shoots flames, and b. ), because it sounds like it’s spewing testosterone mist instead of exhaust out of its pipes. Another thing that struck us about this build is how it only took Sands and Caballero 15 minutes to finalize the idea behind it. 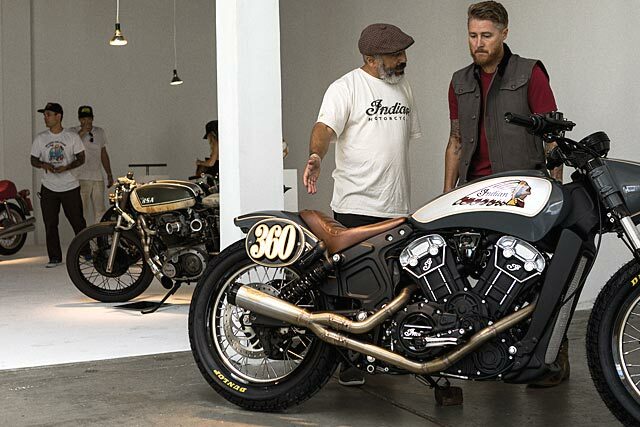 Caballero’s street-flat-tracker-inspired Indian Scout Bobber manifested from that simple brainstorm into a celebration of simplicity that while similar in appearance to the standard Scout Bobber, has a flavor all its own. 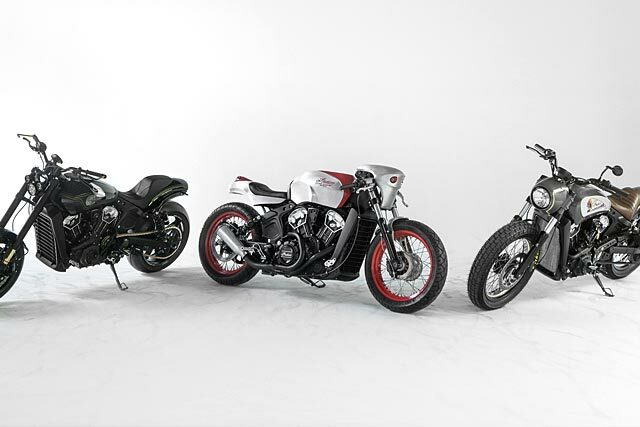 So there you have it: a motorcycle show that moves the needle forward for all of two-wheeled culture, complemented by three motorcycles that will be sure to influence avid customizers for a while yet. The 2017 Brooklyn Invitational has done it again and celebrated cultural diversity in motorcycling. 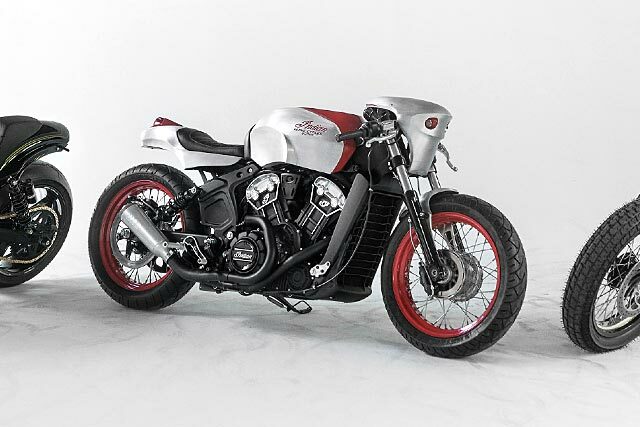 The three customized Indian Scout Bobbers have gone a little bit further, though. With the influence we think they’ll have, we’re looking forward to seeing their designs’ impact on next year’s Brooklyn Invitational. The fine print: In an effort to keep things as legit as possible, we feel it’s best to mention that Indian Motorcycle paid for Manuel’s trip to New York to see their new custom bikes and also shouted him food, drink and lodgings. Rest assured that if the bikes weren’t up to scratch, we’d have no problems saying it. We will always endeavour to give you the best reviews possible without fear or favour; bike companies bearing flights included.